For tonight, we have Olli Mustonen as conductor and solo pianist. Programme consists of a piece by Rautavaara, Mozart's Piano Concerto no. 24 C minor KV491, and Prokofiev's Symphony no. 6. 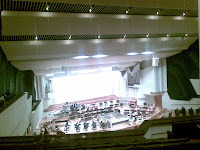 I got to Finlandia Hall's ticket office around 6pm. The ticket lady tells me tickets are all sold out, and if wanted to be on the waiting list. I have no idea who Olli Mustonen is, but I figured he must be good, so yeah. Half an hour later I got my balcony ticket for €17.50. The lady offered me the student ticket for €5. Unfortunately, I'm way past being a student. Wrong time to be attending a concert. For one, I'm exhausted from a full day of doing nothing inside the classroom. Second, I'm not really familiar with any of the pieces, which tends to make me drowsy. All in all, I probably slept through 85% of the concert - not counting the intermission. I reckon I must be nodding off pretty badly because I can sense the lady beside wasn't too happy. Incidentally, it's St. Lucia's Day today. I should've just gone to the Senate Square instead for the coronation of St. Lucia. 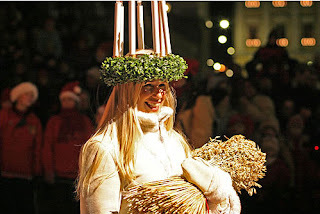 Every year, a young blond girl is crowned as St. Lucia at the Cathedral. With her crown of candles and dressed in white, she leads the parade from Senaatentori, along Aleksanterinkatu and Mannerheimintie to the city centre.